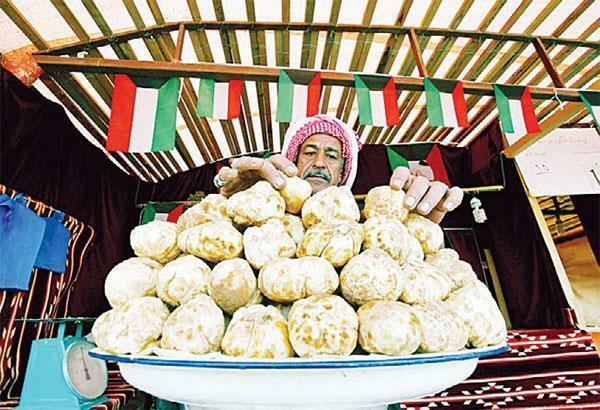 KUWAIT CITY, April 14: The truffle market in Al-Rai area has witnessed relative calm with just a small influx of citizens and residents, in the absence of the Kuwaiti truffle, which entered the market for a limited period months ago, while the Saudi, Iraqi and Iranian truffles dominated the market at varying prices according to size, reports Al-Qabas daily. While large quantities of imported truffles were available from Libya, Saudi Arabia, Egypt and Tunisia in stalls, owners complained of weak consumer demand at the beginning of the month compared to the last three months. The majority of available varieties were 'Shahba and Zubaidi', which are larger than others, the prices ranging from two dinars for one kilogram of the Iranian 'small and medium size' type, 4.5 for a large size, while Iraqi prices ranged between 5 for small-sized, 6 for medium and large, while Saudi prices ranged between 4 and 8 dinars by size. Drying storage it was noticed that prices are currently falling satisfactorily where one kilo of some varieties were sold for 12 dinars, the average 15 dinars, and the big during the previous months was sold for between 18 and 25 dinars, and the Shahba was sold for 20 dinars per kilo, while the 'Zubaidi' was sold for 25 and 28 dinars per kilo. The Kuwaitis pointed out they have purchased truffles recently and cleaned it because of suspected dust and refrigerated to put on the breakfast tables during the next Ramadan.